This is a brand new add-on called Minecraft Pocket Edition: Chicken Bodyguard Add-On. 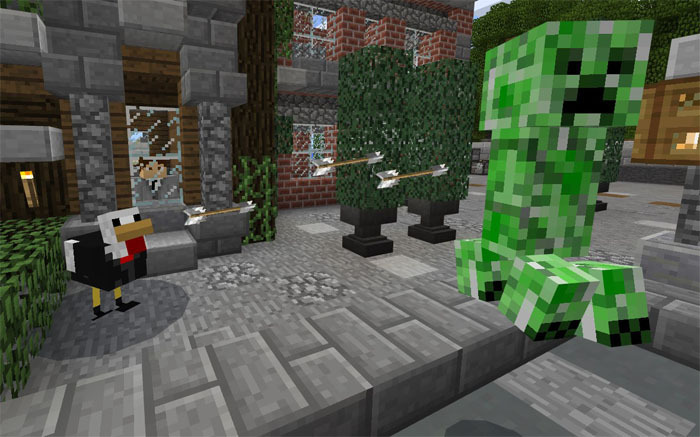 Are you tired of being a constant target by creepers, zombies and other hostile mobs? Get some Chicken Bodyguards! The Chicken Bodyguard replaces ordinary chickens in-game with a a type of bodyguard. You can hire them by feeding them some diamonds. As soon as they have been hired they will immediately start their loyal mission to defending you. Enjoy playing! Creator: DarkGlade03, YouTube Channel, Enjoy playing! You can tame a chicken by feeding it a diamond (60% tame chance). If you are successful, then it will increase 1.5x its size and also start follow and protect you. iOS / Android: Long press on the chicken with a diamond and press tame. Bodyguard Chickens (also known as tamed chickens) are slightly larger than an ordinary chicken. They follow their owner around and will attack any nearby hostile targets which come in the way. You can ride a chicken and to control it you can use a diamond sword, stick or a bow. No more creepers creeping up on you! Your Bodyguard Chicken will quickly come to your assistance and eliminate any possible threats! 1. Download Chicken Bodyguard Add-On (+Resource Pack) here!